Hannah Kent rose quickly to justified prominence with her stunning first novel Burial Rites. That book, set in the harshness of Iceland took a true story and brought it viscerally to life. While the method is the same, and there are similarities between the two books, The Good People explores a very different landscape and a very different culture. 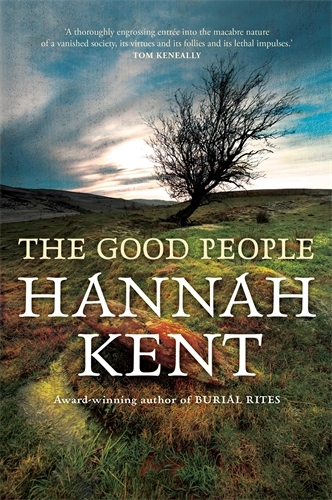 The Good People opens in a small village in Ireland in the 1850s. Norra and her husband have been eking out an existence and trying to look after their disabled grandson Michael. The four-year-old cannot talk or use his legs, he was left with them by their son-in-law when their daughter died. When her husband dies suddenly Norra is left adrift. In the highly superstitious villages this death is seen as evidence that Michael is a changeling, a child stolen by the fairies, or Good People. The village itself is caught between the old ways and the new. Kent effectively captures the tension between the desire to put the old superstitions aside and the pressure on villagers from the new priest to fully commit to Christianity. The old ways are represented by Nance, a woman who understands the fairy lore and uses traditional healing. The priest is intent on driving out these old ways by creating distrust in Nance. The villagers distrust Nance and seek to side with the priest while also remaining staunch in their belief that troubles, from a miscarriage to failing crops, have been caused by the interference of fairies. As tensions in the village rise, Norra seeks out Nance to drive the changeling out of Michael as she believes this will bring her grandson back from the land of the fairy. At the same time Nance increasingly finds that she needs to prove herself and her old ways against the distrust being sown in the village. In the middle of this is Mary, a teenager hired by Norra to help her with Michael. Mary is caught between Norra’s desire to bring Michael back, her own belief that the boy may be a changeling and the care that she develops for the boy. The Good People moves at a fairly languid pace building slowly to its climax. While it feels a little meandering, Kent uses this pace to fully explore the village, its inhabitants and their beliefs. The landscape is also beautifully described – the muddy fields, the dark river and the forest where the fairy people dwell. Much like Burial Rites, the background and climax of The Good People is based on a true story. Hannah Kent takes this story as a scaffold to build believable, hardscabble lives and uses it as a jumping off point to examine all aspects of the issues at play. It reconfirms the talent Kent showed in her debut and marks her out as one of our most interesting Australian authors.